But my question is different. In fact I'm talking about teenagers and I'm asking the causes of this fact, not if there is a correlation with narcissism. Then, why do girls post much more than guys? The question you link to has an answer which says: "narcissism in US men" which is quite a different category than what you ask here. Selfie-ism or Selfitis is not a disorder, or by default narcissistic. Why do [female] teenagers take so many selfies? 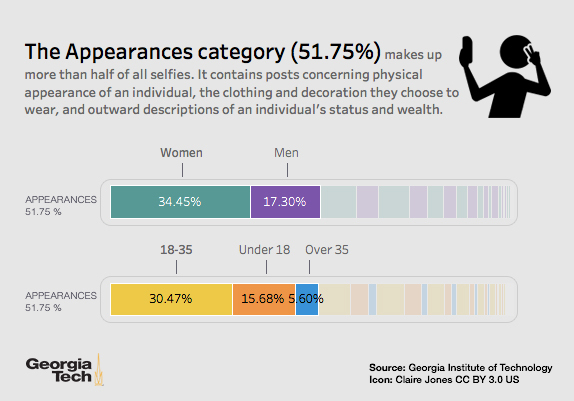 Statista, on their webpage "Selfies Are All About Appearance", reports on a Georgia Institute of Technology study of 2.5M Instagram selfies titled: "Selfie-Presentation in Everyday Life: A Large-Scale Characterization of Selfie Contexts on Instagram" (ICWSM 2017), by Julia Deeb-Swihart, Christopher Polack, Eric Gilbert, and Irfan Essa, that out of those whom do take selfies the percentages are 59% female and 41% male. I'm asking the causes of this fact, not if there is a correlation with narcissism. It's not all about appearance, only 52%; with 14% family, friends and pets, 13% about ethnicity or nationality, 7% travel, 5% health and fitness, with the remaining 9% falling into other categories. Most: Comments, compliments and likes. (World Disclosure). Confirmation: I am wearing properly applied makeup, and have great clothes. Look: Where I am, what I have, where I go, whom I know. 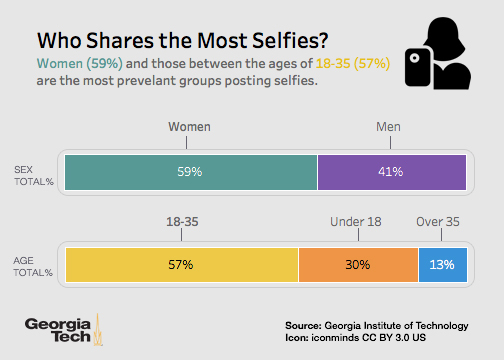 As you can see the belief that teen age girls share the most selfies is not correct. It is the skew of the search engines that produces this belief, it not supported by studies. Furthermore their photos are strange, they usually pose in a weird way. See the result of using Google to search for "female selfies" - the results are not particularly different than the two examples you provided, nor would I describe them as weird. See the Selfie Explorer Tool (after the next paragraph) for an analysis of poses. While not directly part of the question the website SuggestMe has a webpage regarding the travel aspect: "Tourists and locals love taking selfies in London" showing the top 10 most popular cities, places, and places per city. Establishing proof that one is worldly, sophisticated, versed in the ways of the world. The "Selfie Explorer Tool" at SelfieCity allows you to generate requests for specific types of selfies based on attributes such as demographics, pose, features, or mood. It also shows which types are more prevalent. "There are few harmless actions that seem to infuriate guys more than young women taking selfies. Psychology Today has an article: "Get Over Selfie Shame!" as does a NYTimes article: "The real reason men hate women taking selfies" and Snopes: "Rumor: The American Psychiatric Association has classified the taking of 'selfies' as a mental disorder" disagreeing with the snap diagnosis. An important problem to acknowledge is the so-called "Snapshot Dysmorphia" a term coined by Drs. Susruthi Rajanala, Mayra Maymone, and Neelam Vashi, in "Selfies — Living in the Era of Filtered Photographs", where people visit plastic surgeons with selfies that have been adjusted by filters using a program such as Facetune and expect to receive surgery to look like their more perfect self. Your health and your life is more valuable than millions of likes in social networks! The Ministry of Internal Affairs of Russia is concerned about the increasing number of traumatizations and even deaths when trying to make a unique self. Each of these cases could be prevented. For this purpose, the Memorandum "Safe Self" was created in the Ministry of Internal Affairs of Russia, designed to draw attention, primarily to young people, to this problem. 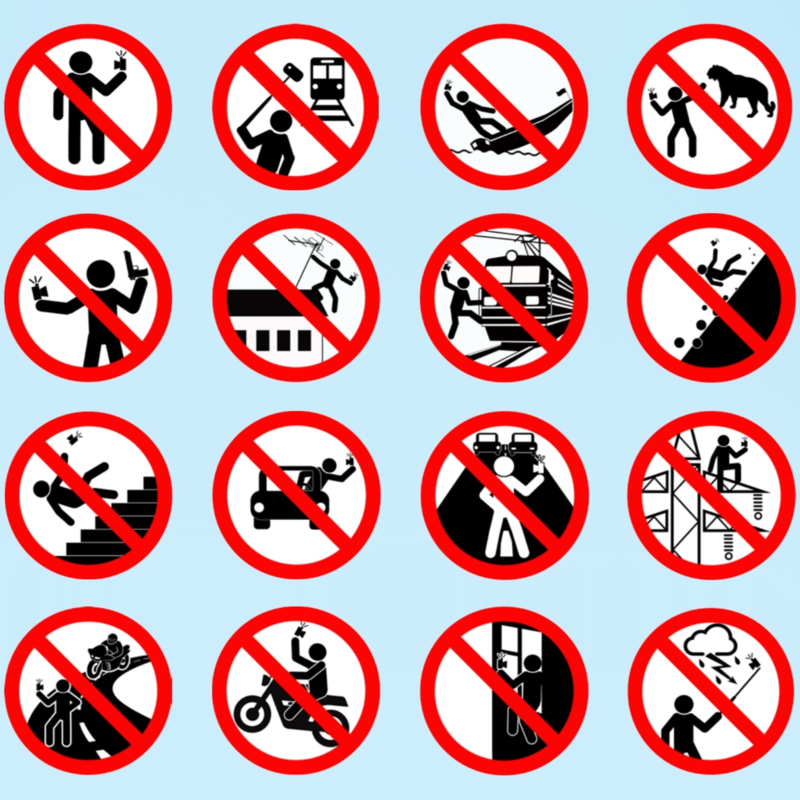 We tried visually, in the form of pictograms, to depict the most traumatic cases of creating selfies, thereby to warn citizens against unjustified risk for the sake of a memorable frame. When a person tries to take a picture of himself - his attention is distracted, his balance is lost, he does not look around and does not feel danger. Do SELFI, making sure that you are in a safe place and your life is not threatened! We hope that our initiative will be supported in all regions, will support young people, adults and children. Download PDF version of Reminder.". Not the answer you're looking for? Browse other questions tagged social-networks self or ask your own question.